October 23, 2014 – Bayonetta 2. That's the big news this week, but there's plenty more to see. (Fantasy Life! Shantae!) So read on or visit your favorite digital storefront today at noon eastern to see all of this week's updates! I guess I could try the Bayonetta demo before anything else but that $9.99 price tag for the first one is really tempting. I'm not sure if $9.99 applies unless you buy Bayonetta 2. Here's my Review of Castlevania: Aria of Sorrow, in case you need convincing that you need to buy this now! I already bought my copy and it's downloading as I type. Did we know Demon's Crest was coming?! I'd get Shantae if I had my own 3DS. Bayonetta 1 is $29.99 if you don't purchase it alongside Bayonetta 2. However, if you buy Bayo 1 first, you can then buy Bayo 2 for $29.99 at any time. Basically, both games are $60, regardless of the order you decide to purchase them. Yes, we were made aware last week. I feel like Pier Solar was announced a long time ago, so I wonder if it's actually going to be released this time. Pretty good week, I'm super interested in Shantae but I may want to wait for the Wii U version. I'll just mention in this thread that Nintendo of Europe seems to be sending out download codes for a free 3DS home menu theme to people by e-mail. I'd guess it's a gift to Club Nintendo members, but I'm not one of them and I still got a download code today, so check your emails, PAL pals. 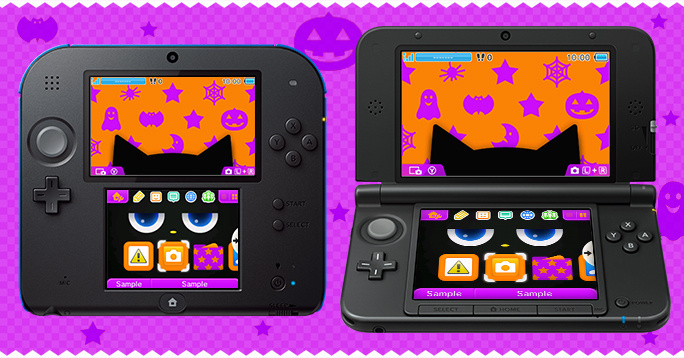 The free theme is the Halloween themed Spooky Black Cat, and consists of a giant cat head with eyes looking in the general direction of your cursor on the bottom screen, and a purple/orange, non-scrolling artwork of ghosts, bats and spiders on the top screen. You also get a pretty nifty music track that sounds like it could have fit in any 3D platforming games ghost level, and a cute little meow sound every time you bring back your 3DS from sleep mode. It can't hold a candle to my beloved Hanafuda theme in any way, but it's not bad for a freebie. Apparently it will be made available for paid download later this month. EDIT: Found this pic after I wrote up my little description. Oh well. Interested to hear how Shantae turned out. I still need to play Risky's Revenge though. Ooo, Shantae! Where the hell did that come from? Shall I keep playing Smash and wait for the inevitable sale or go out of my way to support WayForward...? It's so much better than the GBC game. Lots of great games to choose from today! There's even a Wii U game! Neat! Wow. I am seriously obtuse. I mean, I buy KORG DSN-12 knowing full well the other versions I bought were too intense for my meager mind, and sure enough this latest is, too. I must just love wasting money. Well, at least I supported a developer and piece of software that probably deserves to be supported. And maybe if I actually worked past my frustration and actually tried learning a bit of it before giving up, I may actually grow to like it. Story of my life. I'm holding out for the Wii U version of Shantae and the Pirate's Curse myself. Haha. Did you get much play out of the other ones? Does this one essentially make those obsolete? These releases are so hard to understand! Is it HD or still sprites? Hmm. If it's anything like Risky's Revenge, 3D will enhance the gameplay somewhat. GAH, it's paralyzing! I still haven't decided where to pick up Shovel Knight! Streetpass vs. local multiplayer! Both of which I'd probably never use! GAH! Wait so the 3DS Shantae is also going to Wii U but there is also a unique Wii U game coming? Yeah, I think Half-Genie Hero was the Kickstarted Shantae game from earlier this (last?) year too. I think it's releasing next year sometime. I'm not sure. I just prefer playing on a larger screen when the option is there. That's why I waited and got Mighty Switch Force! 2 on Wii U despite it having identical graphics. Yes, Pirate's Curse is coming to Wii U, though we don't know when yet. Half-Genie Hero is a different game entirely. It's too bad that Korra game didn't hit Wii U, but I think I read it is kind of bad. Such a shame. Were there ever any other good Avatar games?